Below is stuff (or a close variation) that I usually have on me or very near me at most times. LokSak containing medical quality nitrile gloves and some form of Celox Hemostatic, above photo'd is a Celox Blood Clotting Granule Applicator and Plunger Set. Keep them inside the LokSak so they stay dry and last longer. You can also put the medical-size roll of duct tape in there too if you can fit it, depending on your load out. By the way, if you do not have a medical sized roll of duct tape, you are missing out on a great multipurpose tool. 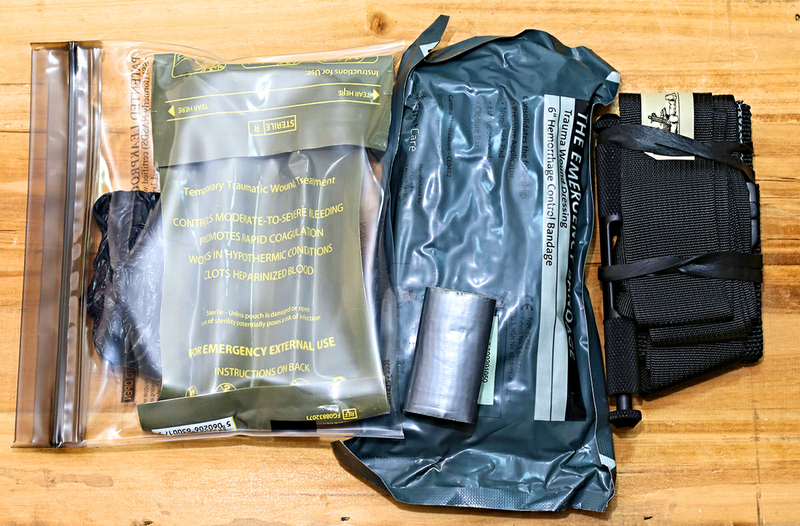 Israeli bandage is a must for most med kits, solves the majority of issues you will come across, I carry both the 6 and 4 inch depending on the occasion and kit. The last one is a SOF-T WIDE Tourniquet, this is a "d-link" style TQ that you can pop open, expand, wrap around and then pop closed, then tighten. It is by far my favorite TQ to have and folds pretty easily. You should have at least one of each of these things on/near you (maybe in your car?) if you carry a firearm.